Steve Roake is as passionate about his bikes as he is about hopping and what’s more he rides his bikes they aren’t for show or to be trailered to shows. Natural then that his approach to restoration involves practicality. Now the downside of many of the old Jap bikes is corrosion to nuts and bolts and anything that isn’t painted or probably was! Here is his take on the early stages of restorationitist. It’s totally mad, and yet there are immense feelings of pride in replacing a few old bolts for stainless steel ones on your old “Pride and Joy”. What is it about changing a few stupid bolts that instils this sense of wellbeing in grown men and women? Welcome to the world of restoration. I know it because I’m afflicted by the phenomenon myself. 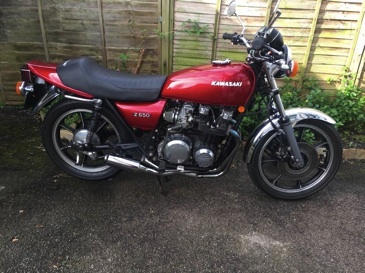 In my case the object of this intense scrutiny and reverence is a 1980 Kawasaki Z650 motorcycle. I’m sure age is a big factor in why we get all starry eyed about such things that placed a significant part in our past, you reach a point where suddenly things that were passé and old suddenly look fresh and retro en vogue. Simply travelling to your local old -fashioned tool store with a list of bolt sizes which have to be stainless steel becomes a thing you start looking forward to, and compiling the list of what to get next verges on obsessive behaviour. To an outsider, this surely is classed as a form of lunacy and yet more and more of us are starting to do it. Look at this photo and what do you see? Shiny new bolts, then a castle nut in chrome and a stainless cotter pin. What do I see? I see that the next thing that needs to be done is the adjuster bracket that needs chroming! The really mad bit in the above photo is that the adjusted blocks which you can hardly see are made out of stainless steel and would cost you £75 for a pair to be made, and you hardly even know they are there. Let’s start with the rational thinking bit. Why an earth could something so archaic be so pleasing to be around? Newer models are more refined, less prone to failures, more efficient, better value for money and yet lack things like soul. All the very things that were so wrong in the eighties with motorcycling are now so right. The ride quality is not great, the thing tramlines like hell. 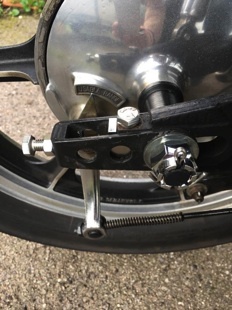 The brakes are next to useless , its smelly and it makes all the right noises ….Brilliant! The sensible answer is that in this horrible world of austerity and debt-ridden life of ours, when you earn little or nothing from having savings in the building society, these buys are now going up in price to the tune of double digit rises. So not only is your passion a thing of beauty it also can be a decent investment in time. The key to it all is to find the right model and watch the prices rise. Spend wisely and put the investment in the bits that will add value to the motorcycle and not in tinsel and glitter. Urban Japanese Motorcycles (UJM’s) are hot property these days and most of them are climbing in price. The rarer the motorcycle or the more popular it was , back in the day, the greater the demand for good examples now. As for me, well I’ve spent long enough talking about this , I’ve got to get back out to the garage and measure up the next bit for replacement. Restoration …It’s a disease for Middle aged Men and Women Lol.